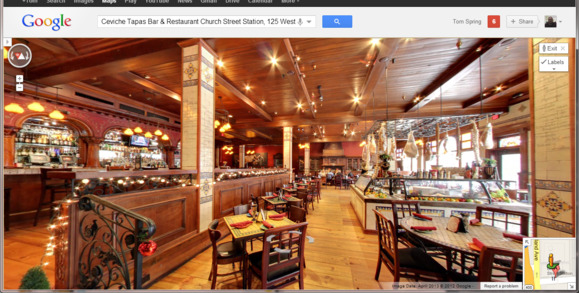 Google has added indoor Street View results to general searches, allowing you to see if the ambiance of that downtown restaurant matches the online review. Google began mixing indoor business Street Views in search results this week for those companies that have supplied the Google with panoramic interior imagery. The 360-degree tours inside businesses and shops are not actually taken with Google Street View cameras. They are panoramic photos taken by “Google Trusted Photographers,” who charge businesses to take them, stitch imagery together, and publish the virtual tours on Google Maps. These indoor Street Views use the same controls as their roadside counterpart, but are so far only available in the U.S., U.K, Australia, New Zealand, France, Ireland, the Netherlands and Canada. The tours were available since September through Google Maps, and now they will also show in Google Search results. When you search for a business, you will see on the right side a panel with photos of the business, its location on a map and a new “See inside” tag that takes you to the 360-degree tour of the premises. The interface for the tours is just like the controls for Street View imagery, where you can zoom in, pan around a room or move through the building. The interior tours are particularly useful when you have to pick between restaurants, or check out shops ahead of your vacation. Business owners outside the countries where Google is running its Trusted Photographer scheme can also upload their photos on Google Maps, but users won’t be able to walk around the shops like with the indoor Street Views. Meanwhile, you’ll be able to use Google Maps to track Santa’s journey around the world.